The images above are preliminary pencil sketches. Final prints will be in full color. 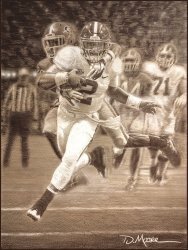 "Miracle on the Plains" and "The Runback"
Order this combo and you will receive a free pencil sketch of "Miracle on the Plains". 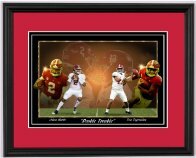 Also by ordering the combo you will receive the same print number on both prints. Approx. 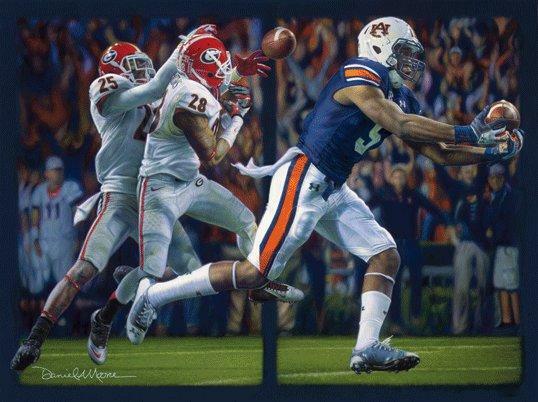 print sizes: 19" x 25"
Miracle on the Plains captures the miraculous catch to defeat the Bulldogs in Jordan Hare. 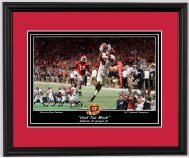 The Runback captures the miraculous last second, 109-yard Field Goal return for the game winning touchdown, as the Tigers turned the Tide and preserved their path to the SEC and BCS Championship Games. 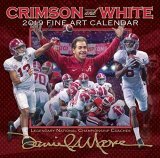 Birmingham, Huntsville, Florence, Tuscaloosa, Montgomery and Mobile. Free pencil sketch included with your order. 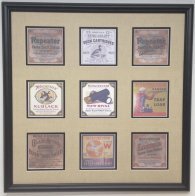 Enter Coupon Code FRAMING at checkout and receive $50 off your framed combo. 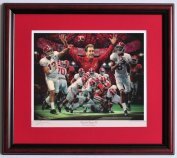 Choose any of our framing packages and receive FREE delivery to many areas in Alabama. *Please note: Debit cards when authorized actually remove the funds from your bank account temporarily, however the entire amount will be returned to your account in approx. 3 days if you choose the pay later option.